Elizabeth Jennings was running late. It was July 16, 1854, and Jennings, a 24-year-old teacher, was headed to the First Colored American Congregational Church on Sixth Street and the Bowery. At Chatham and Pearl Streets, she boarded a streetcar. Like schools, hotels, and many jobs, streetcars operated on a de facto color line and often refused black New Yorkers. On this summer morning, the driver insisted Jennings get off and wait for a colored streetcar. She said no. “I told him . . . I was a respectable person, born and raised in New York . . . and that he was a good for nothing impudent fellow for insulting decent persons while on their way to church,” she later said, according to a 2005 New York Times article. Jennings was forced off. But the story was just beginning. Her prominent family hired a young lawyer (and future U.S. president) named Chester Arthur to take her case. Jennings won and received $250 in damages. Still, it took several years of lawsuits for the city’s streetcars to be fully desegregated. 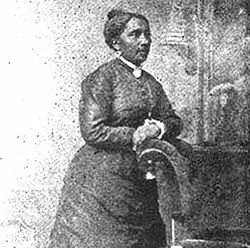 Elizabeth Jennings married and had a son; she ran a school for black children and died in 1901. She’s buried in Cypress Hills Cemetery in Brooklyn, but her name lives on with this City Hall street sign. This entry was posted on April 19, 2012 at 2:09 am and is filed under Cemeteries, Disasters and crimes, Houses of worship, Lower Manhattan, Transit. You can follow any responses to this entry through the RSS 2.0 feed. You can leave a response, or trackback from your own site. Cleveland also had an Elizabeth (Eliza) Jennings (1809-1887) who founded a number of philanthropies for children, the ill, and the elderly. The Eliza Jennings Home is still an important part of Cleveland. This is AWESOME! Never knew about this story, worked in the Park Row/ City Hall area as a teen….. I have no idea when the sign went up, I couldn’t find anything on it. Maybe it’s new? That’s a great piece of history. I never heard of this woman. Too often the legacy of Rosa Parks overshadows everyone else who also took a stand against racism. Her lead lawyer in the winning suit was the young Chester A. Arthur, future president of the United States.